Tis the season for Random Acts of Kindness RAK. 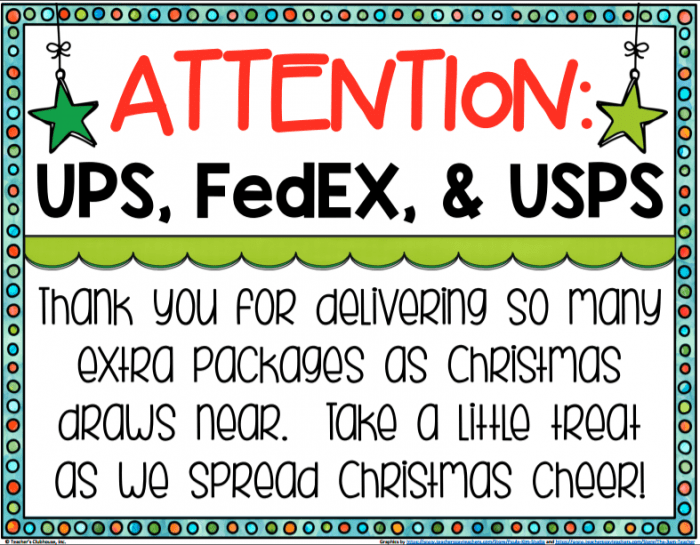 Pay it forward this printable Delivery Christmas Sign for UPS, FedEx and USPS. 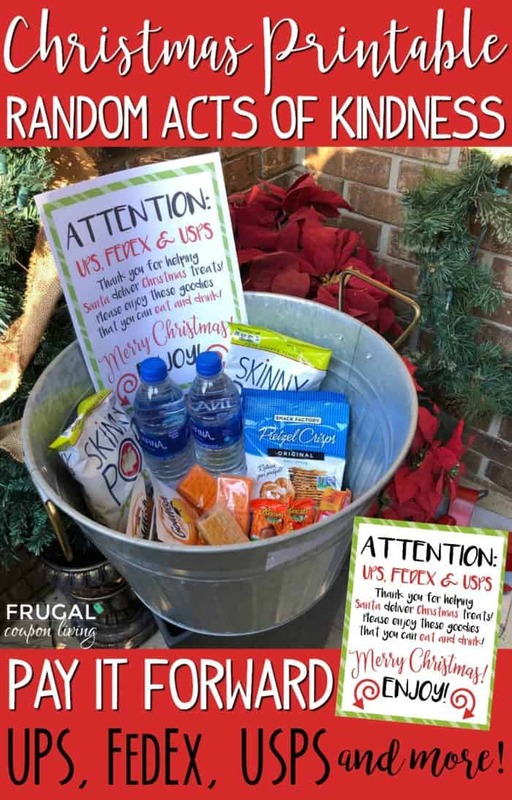 Share with snacks and drinks in a bucket at your front door. I don’t know about you by the UPS, FedEx and USPS driver are at my door multiple times a week! During the Christmas season, their visits become even more often, as much as multiple times a day! A few years ago I shared with you one of the most creative Random Acts of Kindness idea from Cara at The First Grade Parade – She is pretty awesome! 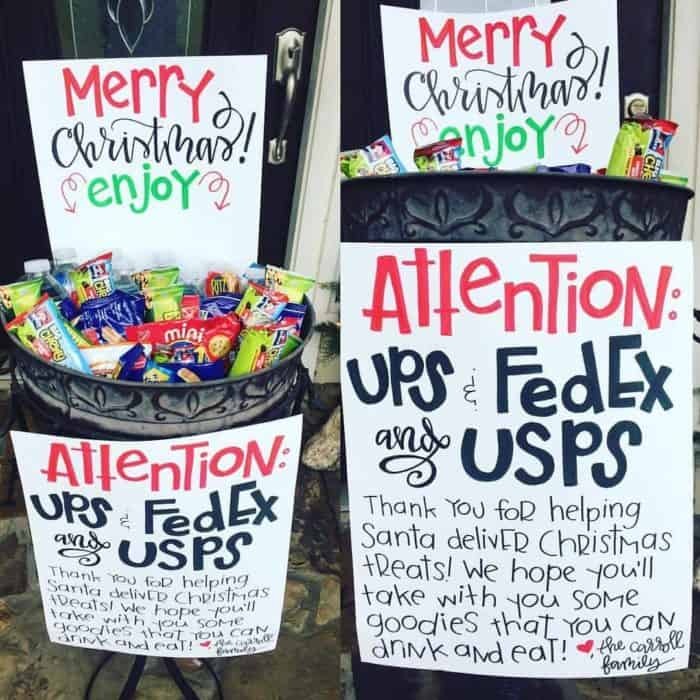 It’s a great way to pay it forward to your UPS, FedEx or USPS drivers! She probably is one of the best Hand Lettering artists I know! Since not many people are as talented as Cara when it comes to Hand Lettering, I wanted to share with you a free printable so you can do the same random act of kindness at your front door, even though you might lack the calligraphy talent! Not many directions needed for this tutorial. Fill your outdoor bucket with drinks and snacks. 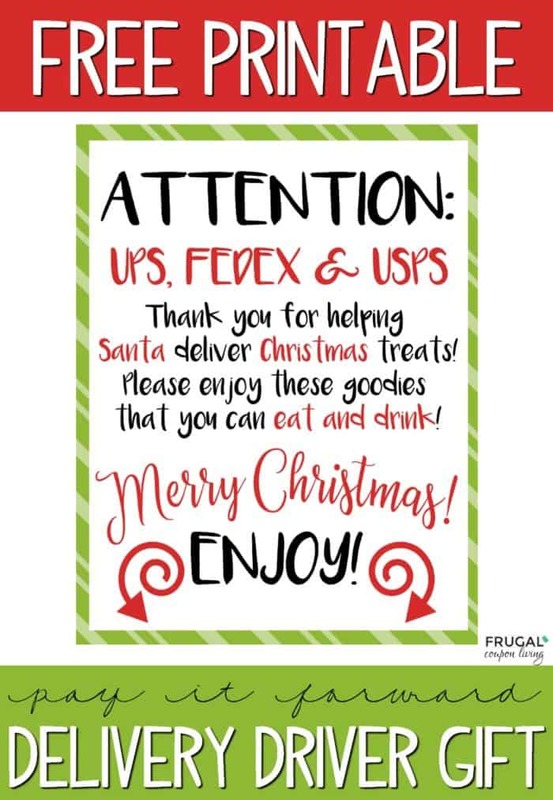 Print our Delivery Christmas Sign for UPS, FedEx and USPS and tape to the front of the bucket. Replenish snacks and drinks as needed. 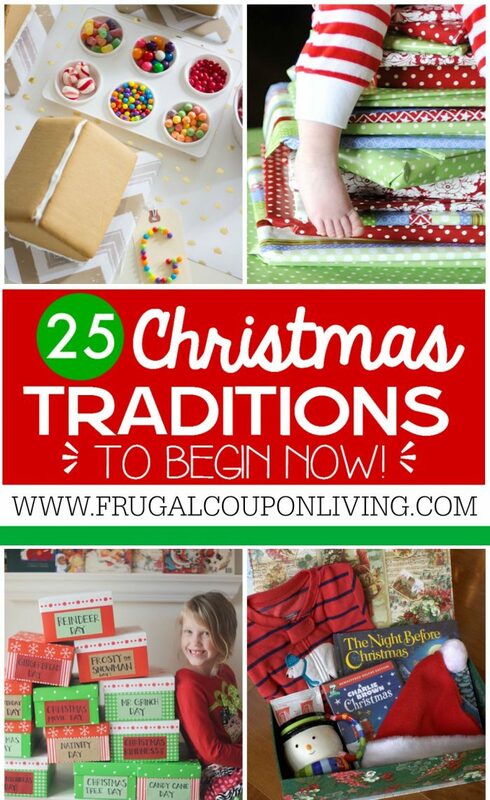 Also enjoy these Christmas Traditions to Begin Now. Pin to Pinterest on your Christmas Boards. Pay it forward to the neighborhood as well. 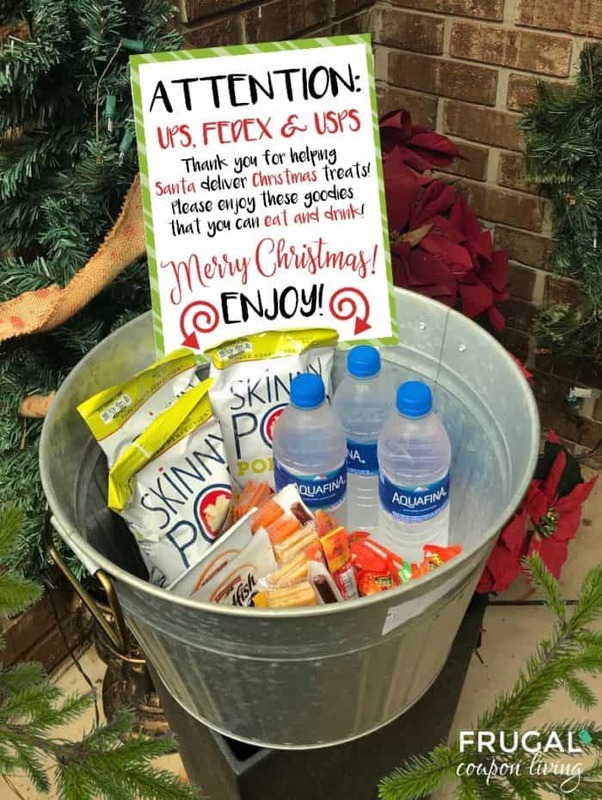 Enjoy these Christmas Gift Ideas for Your Neighbors. Pin to Pinterest on your Gift and Christmas Boards. Currently browsable Walmart Ad. 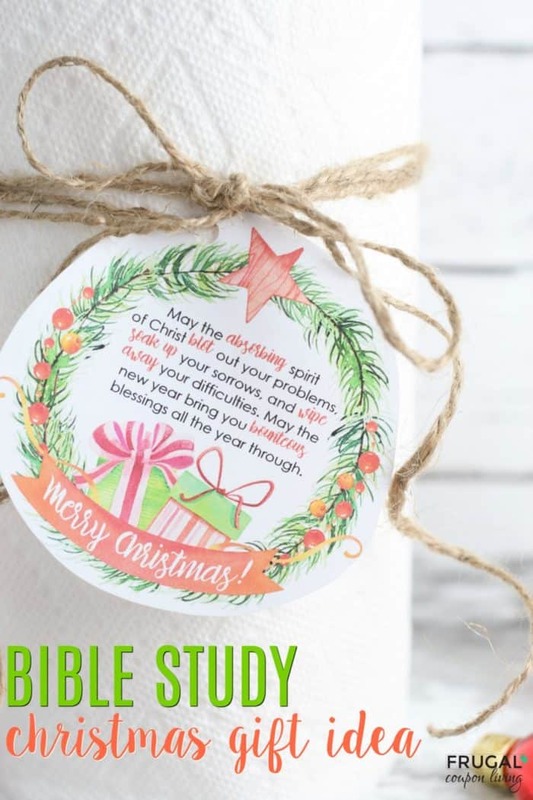 Absorb the spirit of Christ this season with this Bible Study Christmas Gift Idea. Bounty paper towels with pun saying to blot out problems, soak up sorrows, and wipe away difficulties. My Bible study has grown and sometimes it’s hard to think of something creative and cute without spending an arm and leg. I was trying to come up with something creative for my girls, without baking (the holidays add enough calories) and this gift tag came to mind. 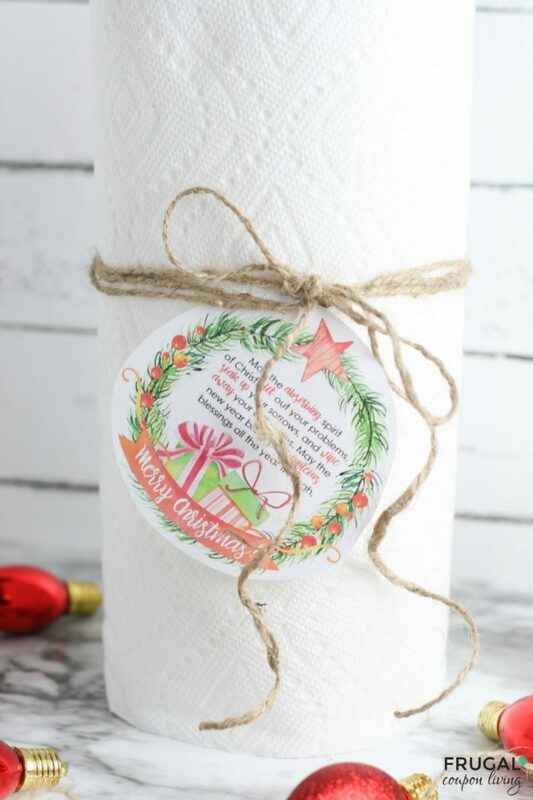 Of course, there is nothing exciting over the gift of paper towels, but I love the pun and the message for the season! Not many supplies are needed for this gift. First, I subscribe and save on Amazon to Bounty Paper towels. So these paper towel rolls were actually something I already had – that reminds me, I need to order MORE for our family! I needed 13 rolls to gift to my bible study girls and my leader. I used twine that I keep in my gift wrapping drawers. Curling ribbon could be cute too. What about this black and white check ribbon? You will also need our free printable. I give the link to that printable below as well as how to order your printable online so it is printed in the store – save on ink and paper. We got our gift tags for under $1. Gift Tip! 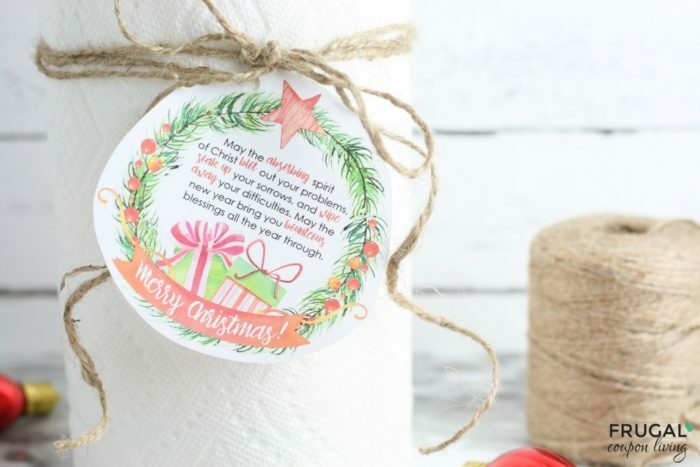 Pair this gift with scented holiday soap, cookie mix, cooking gadgets or tools, or make an entire basket of items and include this punny tag with a roll of paper towel! May the absorbing spirit of Christ blot out your problems, soak up your sorrows, and wipe away your difficulties. May the new year bring you bounteous blessing throughout the new year. Get your paper towel rolls. We like the wrapper off the roll. Tie your ribbon around the roll of paper. Cut your gift tags out and use a hole punch to punch a hole at the top. Thread your ribbon through and tie off your ribbon with a bow. Gift to your girls! 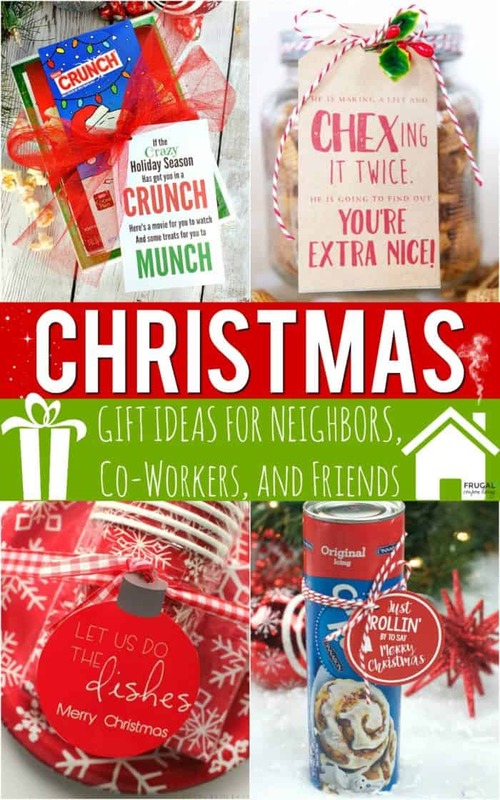 Enjoy these Christmas Gift Ideas for Your Neighbors, Co-Workers, Teachers and Friends. Pin to Pinterest on your Christmas and Gift Boards. 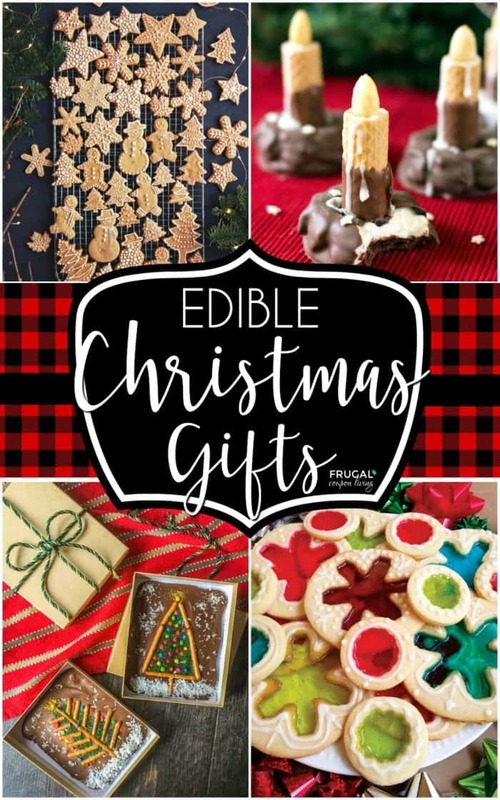 Enjoy these Edible Christmas Gifts. Pin to Pinterest on your Christmas and Gift Boards. 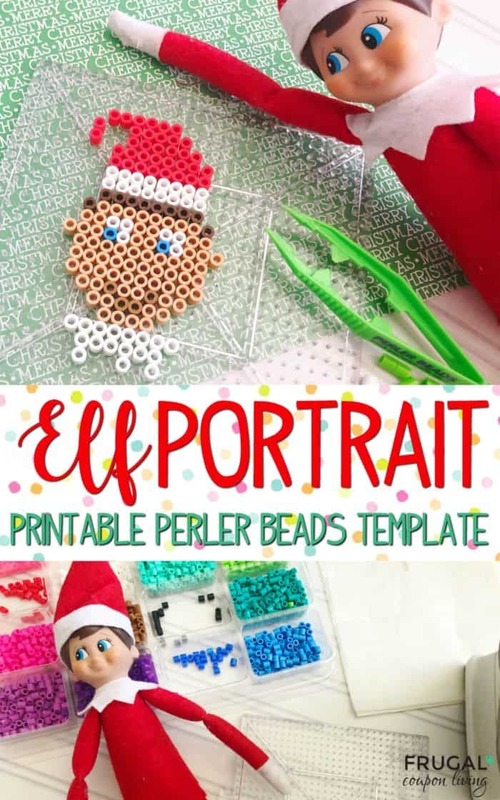 Elf on the Shelf Portrait with Perler Beads printable template for an easy Christmas craft! 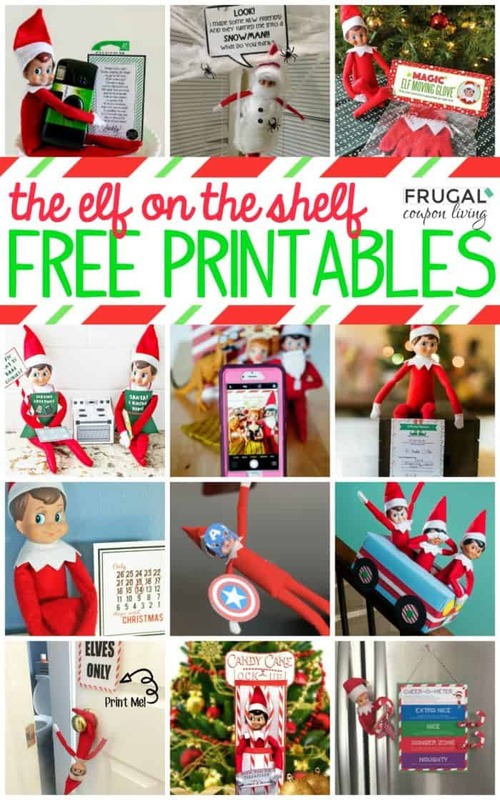 Are you following all of Frugal Coupon Living’s Elf on the Shelf Ideas? 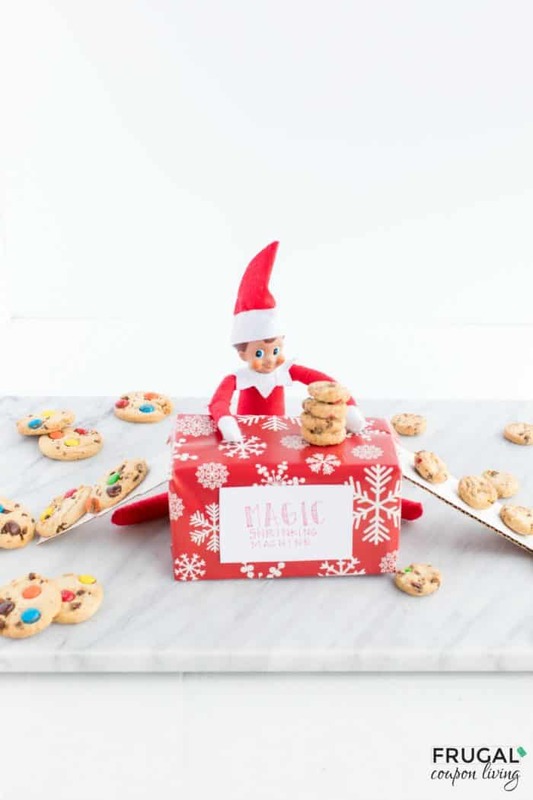 See well over 100s of creative, funny, and original ideas for your Elf! We are very excited to share this free printable with you! It’s a cute way to make a portrait for your elf! Your kids can get involved. 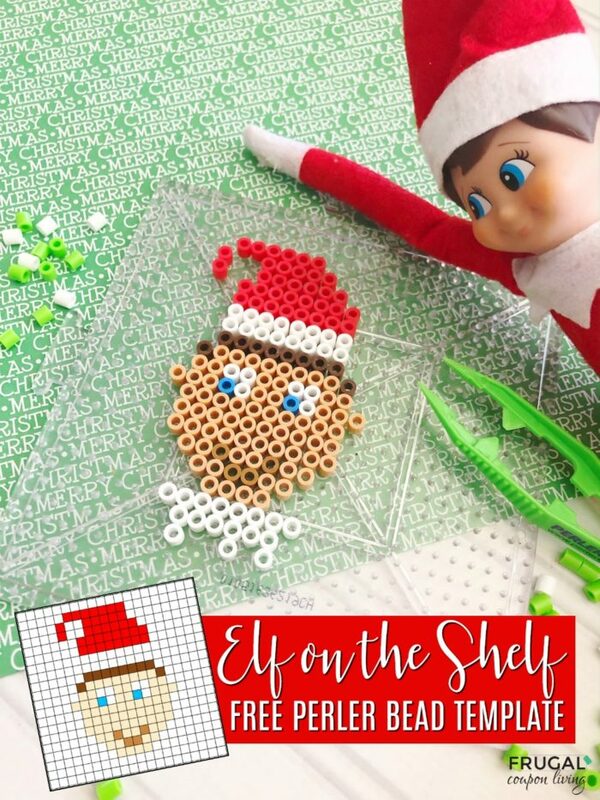 Elf on the Shelf Portrait with Perler Beads Printable Template: This is a fun little project. 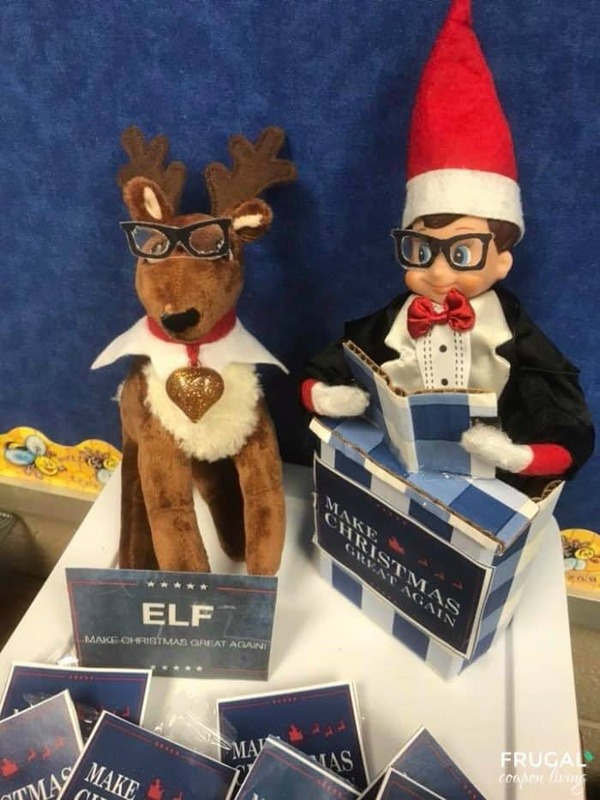 Either crate the elf yourself. You could lay out the Perler Beads and then leave a note asking your child to find the iron and help mom/dad crate a finished elf. 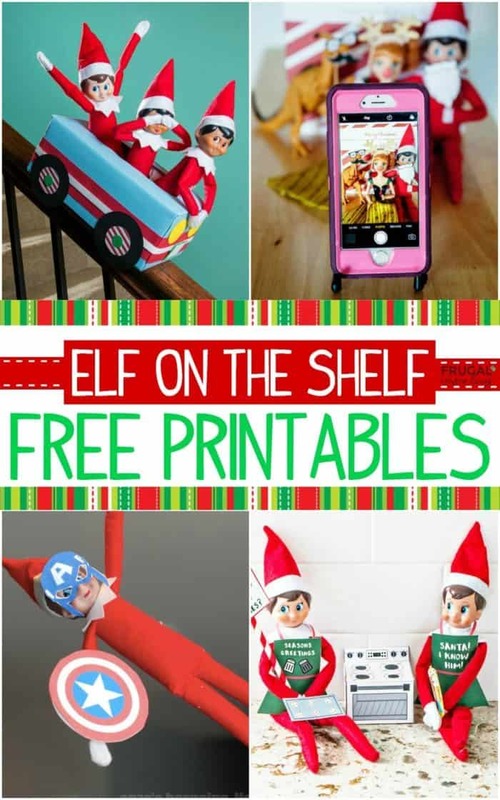 Or you could have elf deliver the free template we are offering, and your child can find a craft-tastic Saturday and make this cute little Elf on the Shelf Portrait themselves. Both ideas provides smiles and joy! 1. 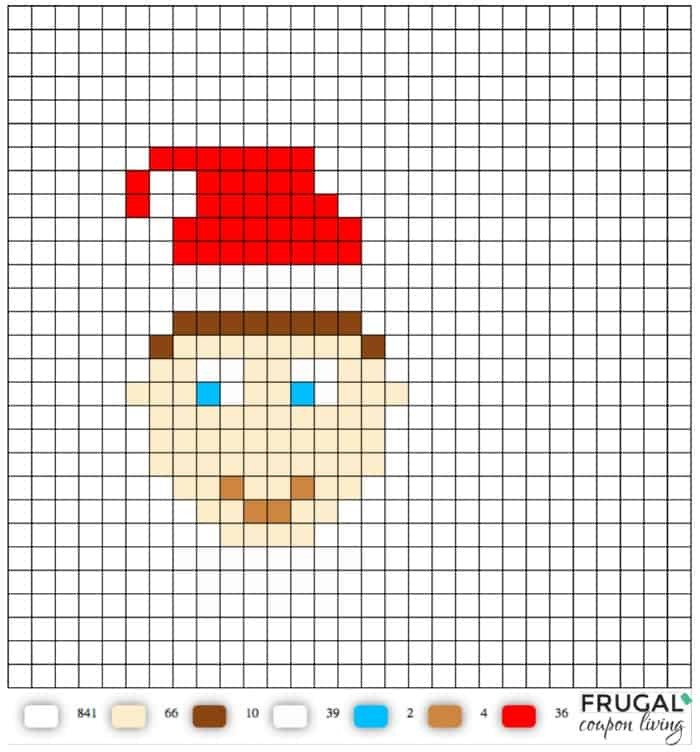 Start off by printing your free Elf on the Shelf Portrait with Perler Beads Printable Template to lay next to you while your craft. 2. 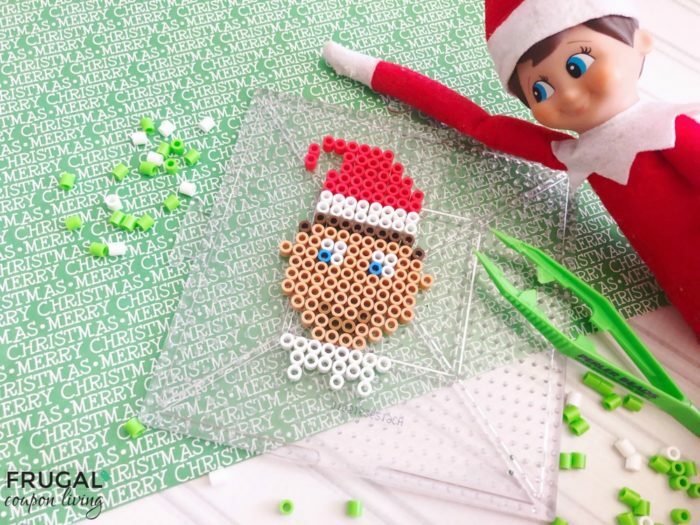 Use your large square pegboard to start your making the elf design. 3. Use the tweezers to pick up your beads, starting with the 4 tan beads on the bottom and work your way up to the top of the face. 4. Now add in the brown beads for hair and 2 rows of white beads on top of the hair for the hat rim. 5. Add on the red beads for the hat and white beads on the bottom for the collar. 6. 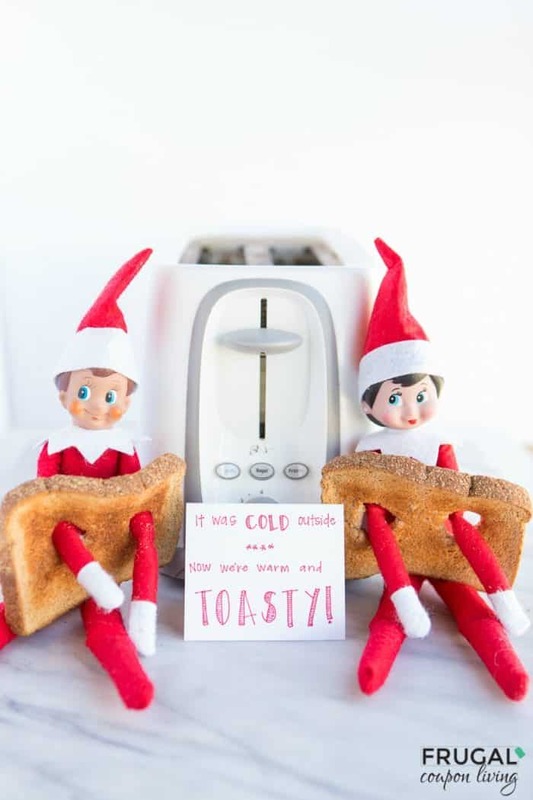 Now you can leave the beads on the board with elf next to it and leave a note from Elf with directions to complete the Elf with a parent as an activity in the morning when they find it. 7. 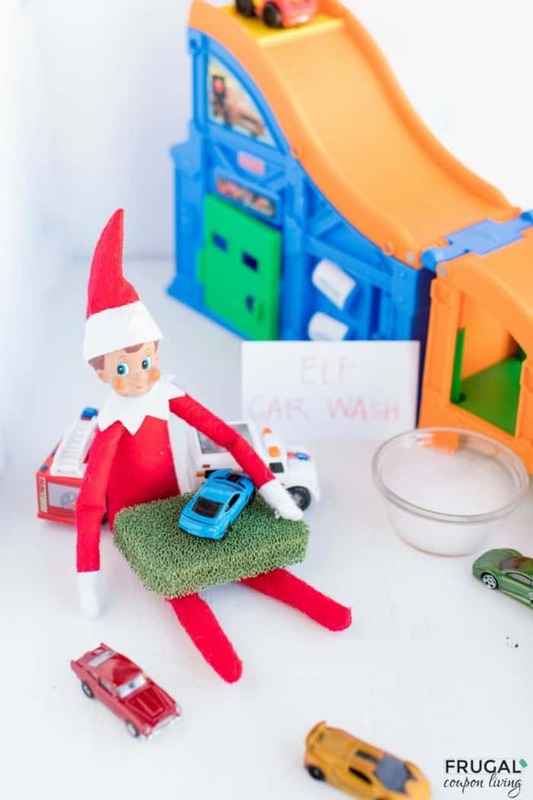 Carefully place a piece of ironing paper over the top of your elf and iron on a dry setting for about 20 seconds (make sure to turn the iron off). 8. Let cool completely then peel your bead design off. 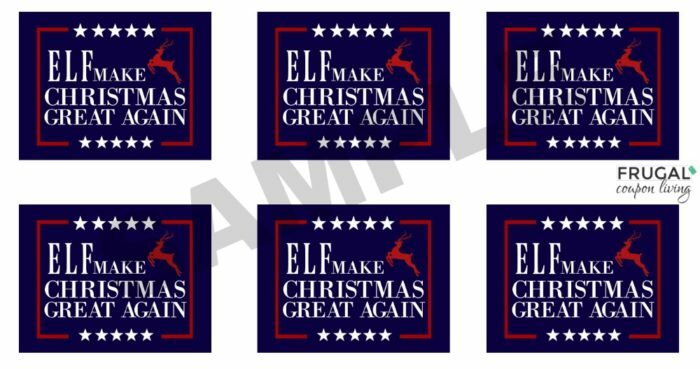 Free Make Christmas Great Again printable! 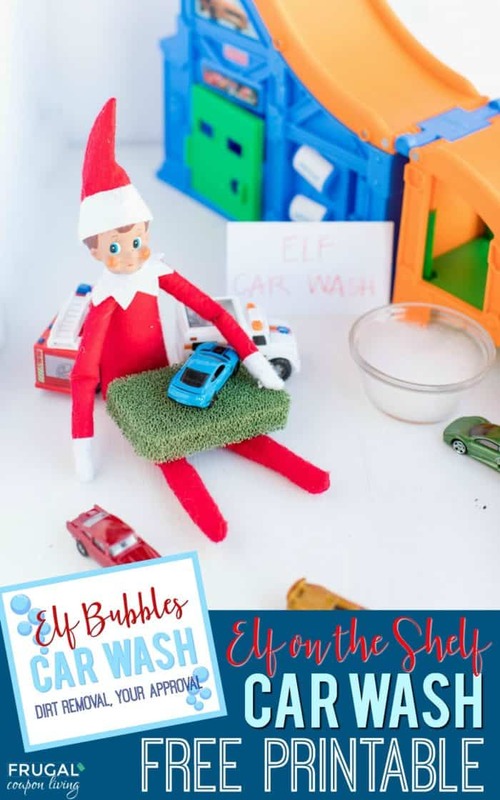 Are you following all of Frugal Coupon Living’s Elf on the Shelf Ideas? 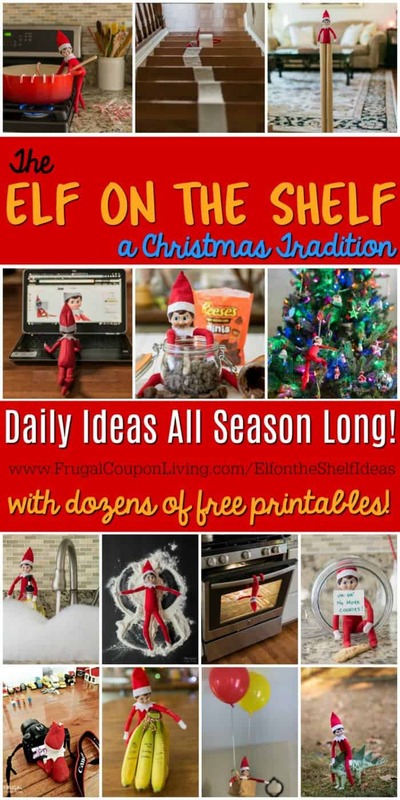 See well over 100s of creative, funny, and original ideas for your Elf! 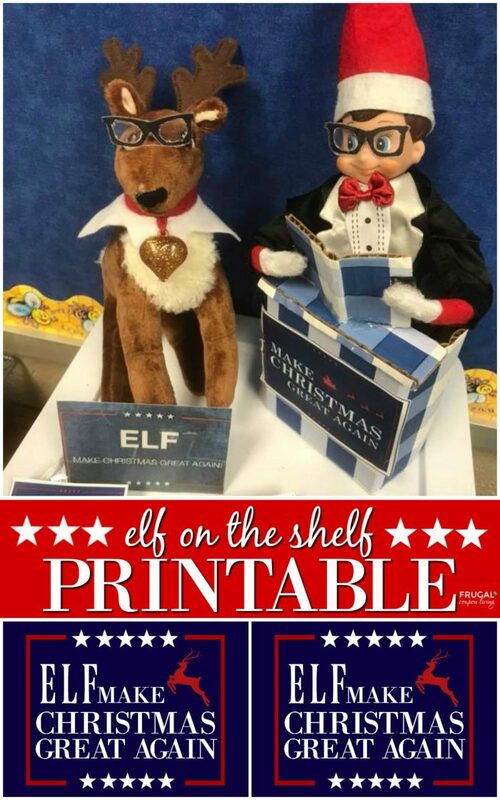 Note: No political views here, we are just having fun with our elf. Please keep negative or positive political comments to yourself. The purpose of this post is for fun, not for a political debate. 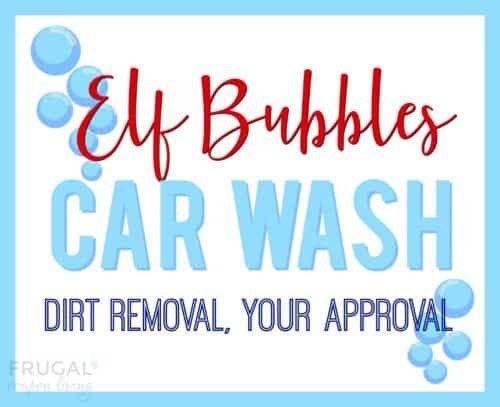 If you like, print and use for your elf. 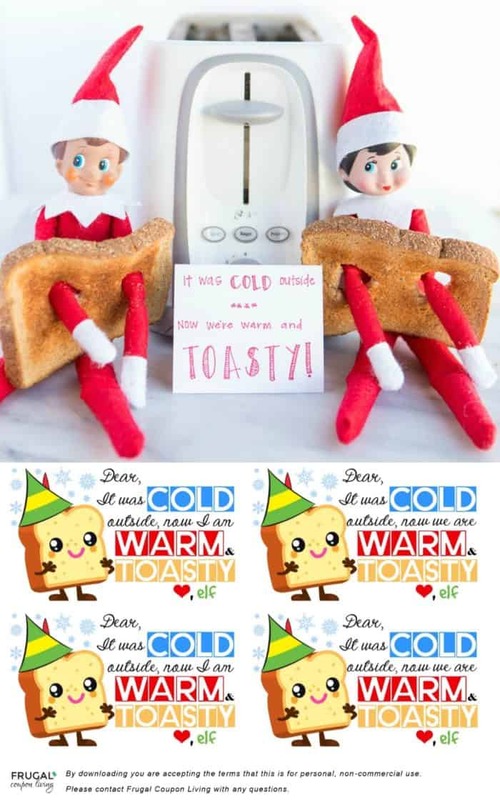 If you dislike, please move on and enjoy other Elf printables that fit your home and elf. Thanks in advance! Batteries not Included. 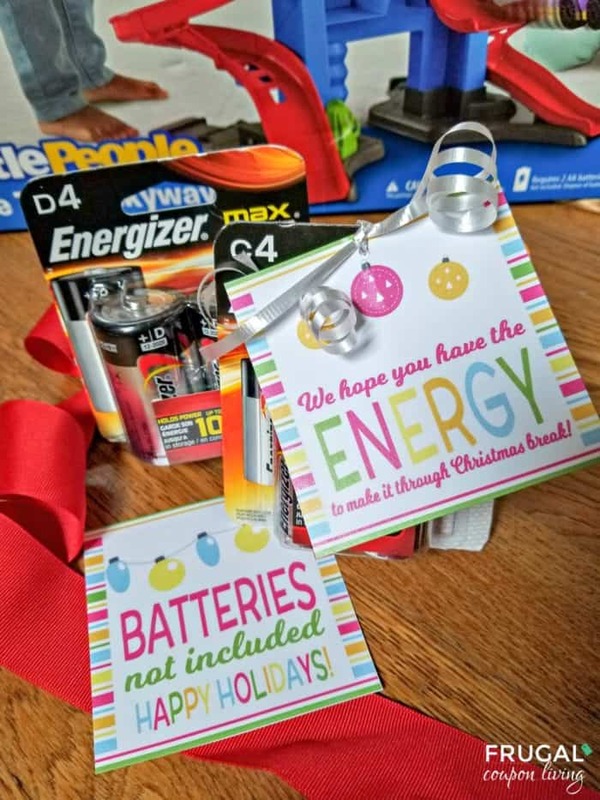 Download this free Battery Gift Tag and become a child’s superhero this Christmas season with this practical gift idea! Or encourage someone with well wishes of ENERGY through the holiday break. On Frugal Coupon Living, it’s the year of the practical gift. In year’s past, we shared with you our Fleece Navidad Blanket (that was a hit) and our M&M Mason Jar Poem. 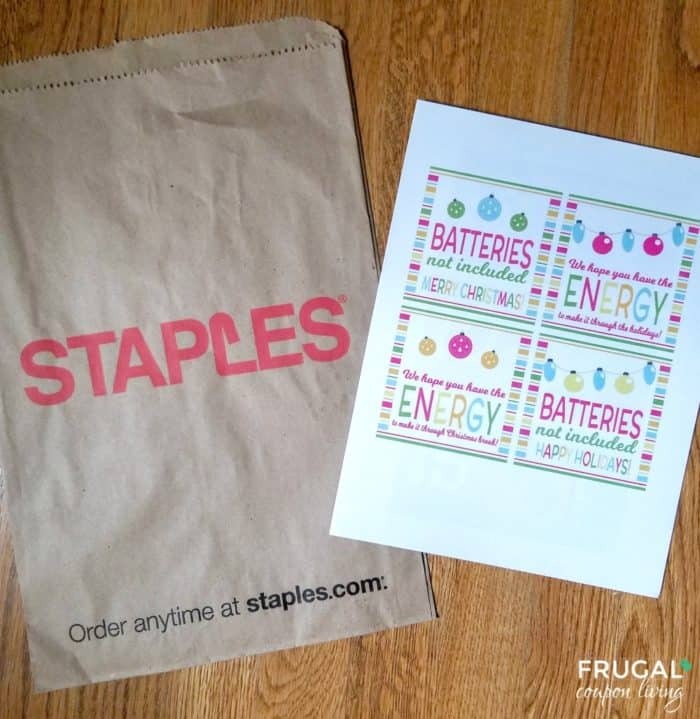 This year we brought you the Gift Wrap Printable and our latest one, a Battery Gift Tag. Both are found in our list of Christmas Gift Ideas for Your Neighbors. 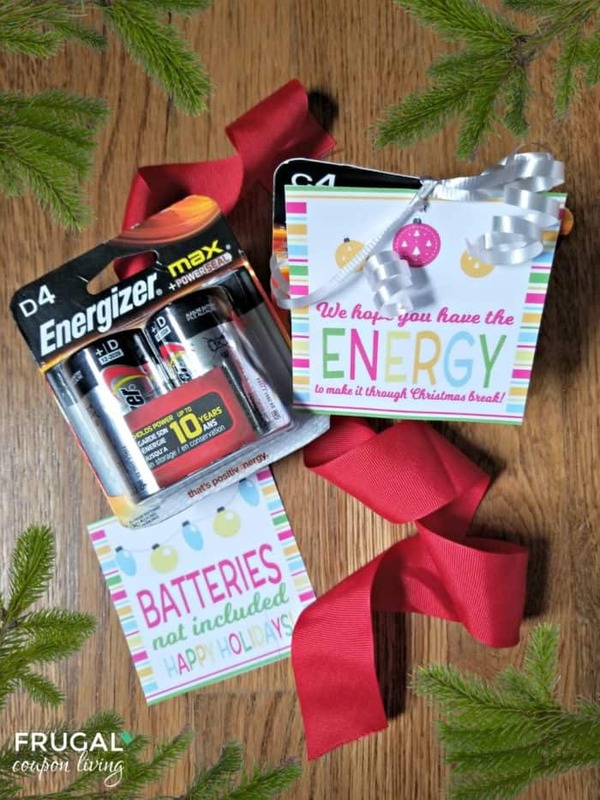 If you want to be a super hero this holiday season, gift batteries. The kids will thank you when they can enjoy their new toys on Christmas morning. You can gift this to neighbors, co-workers, friends, teachers and more! 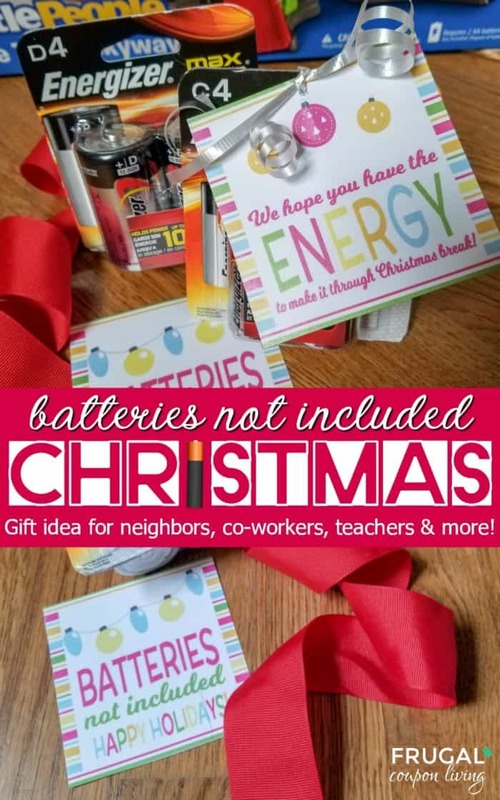 It can be a small part of a larger gift if you just feel silly handing over batteries. Maybe you gift it with a child’s toy too! Not many supplies are needed for this craft. I actually used curling ribbon I keep in my gift wrapping drawers. Seriously my favorite part of wrapping a gift is sliding the blade of my scissors along the back of the curling ribbon and Voilà – there it is, an adorable curl! You obviously need batteries. Like I said, we have a stockpile of Amazon Basic Batteries but they don’t gift as well (unless you wrap with gift wrap.) They come in a cardboard box which could make a pretty wrapped present. I picked up these batteries at my local grocery store – just a quick add to my shopping cart! I print my gift tags at Staples Copy Center, more on that below. 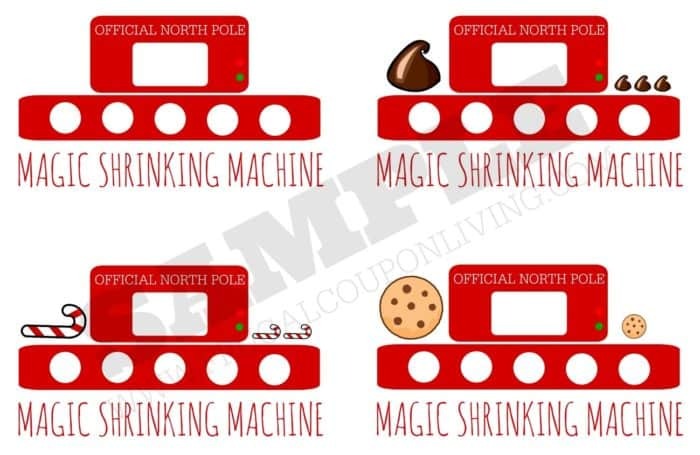 We order our four gift tags for under $1! In your free download, are gift tags for those that celebrate Christmas and those that use more of a generic term like holidays… you can gift this for all! 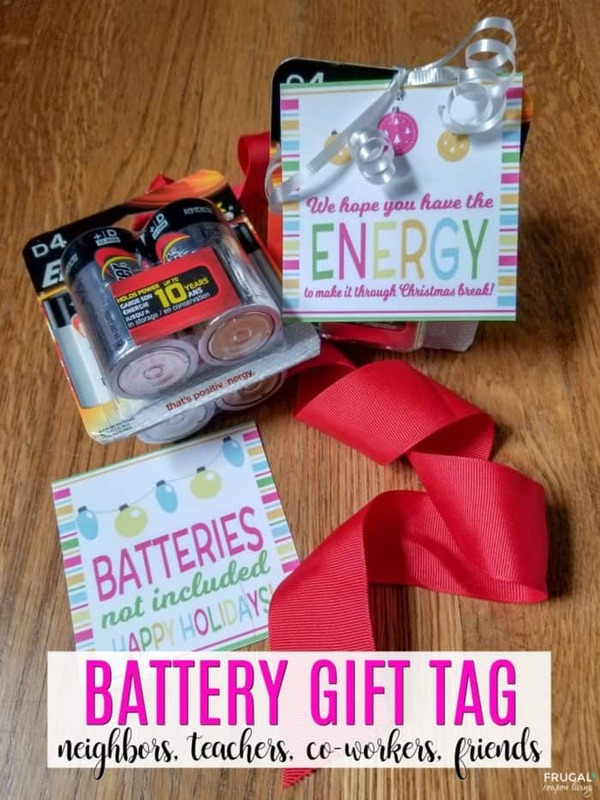 Use ribbon you have on hand and tie your Battery Gift Tag to your batteries without wrapping or you can wrap in a small cardboard box ( the Amazon Basic Batteries will come in an easy to wrap box). BATTERIES not included. Merry Christmas. We have you have the ENERGY to make it through the holidays. We hope you have the ENERGY to make it through Christmas break. BATTERIES not included. Happy Holidays. Our goal is to give you practical gift ideas this year. Take a look at this list of Christmas Gift Ideas for Your Neighbors. So many cute ideas. Pin to your Christmas and Gift Pinterest Boards. Looking for more to give? 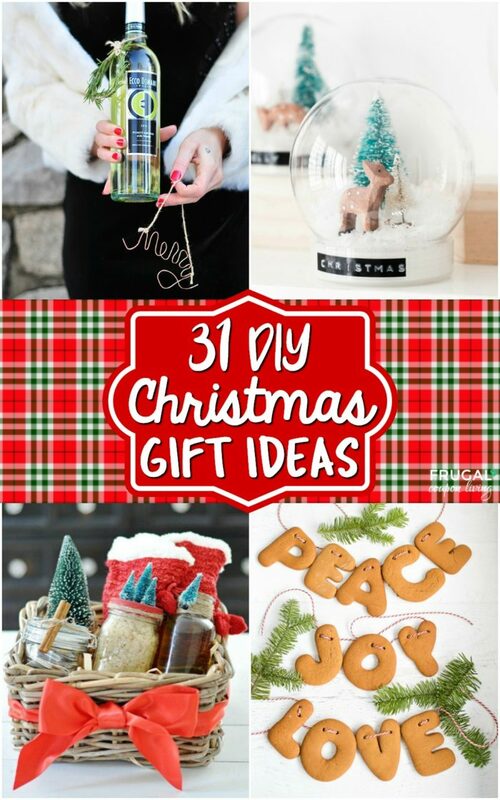 Take a look at these DIY Christmas Gift Ideas Part 1 and DIY Christmas Gift Ideas Part 2. Pin to Pinterest on your Christmas and Gift Boards. 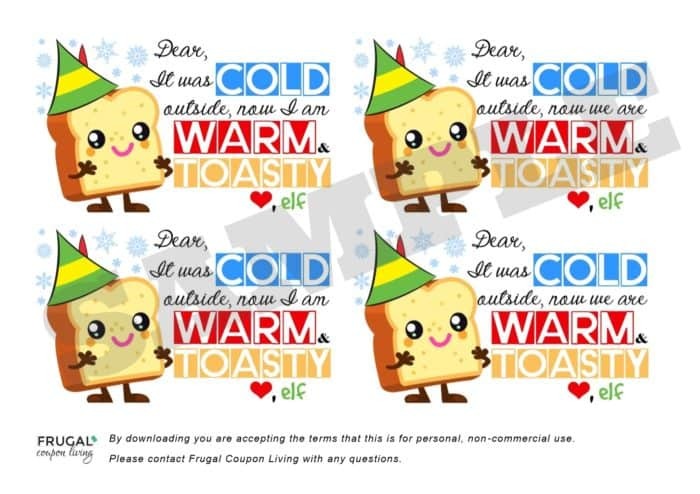 Want more printables? We want to share them! 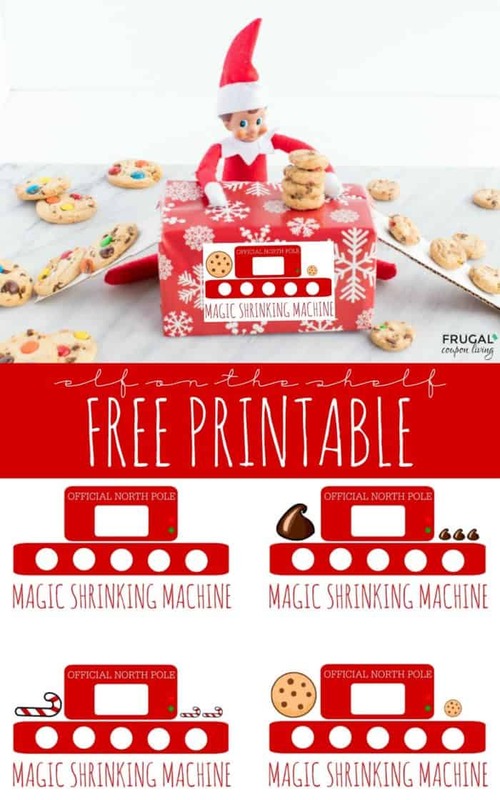 Take a look at this list of 31+ Free Christmas Printables. 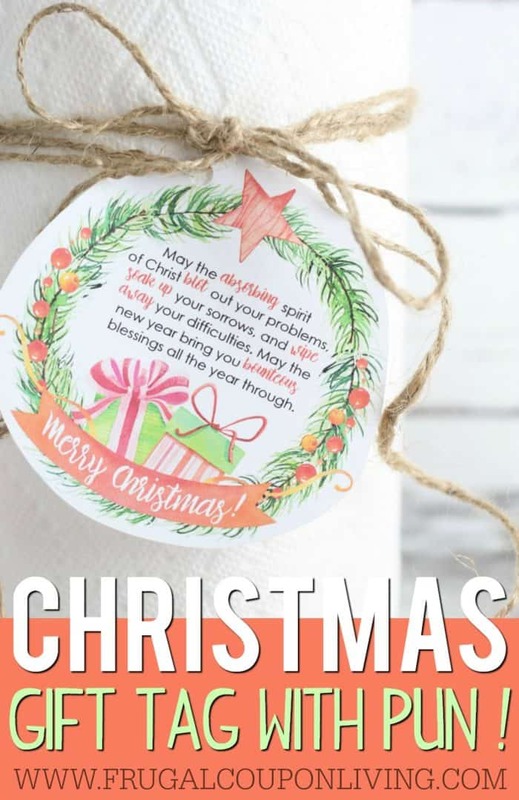 Pin to Pinterest on your Christmas and Printables Boards.